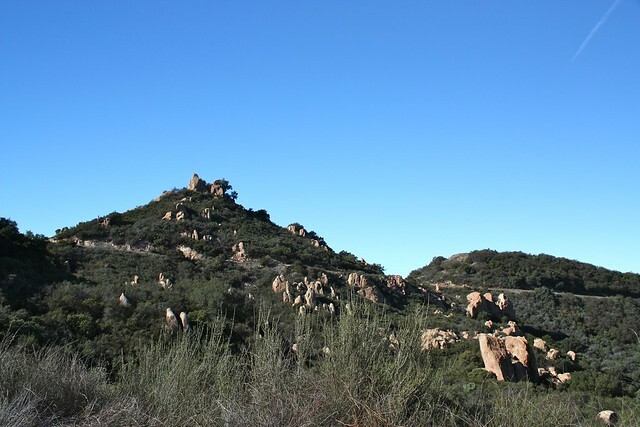 A 7.6 mile out-and-back in the southwestern portion of Malibu Creek State Park. 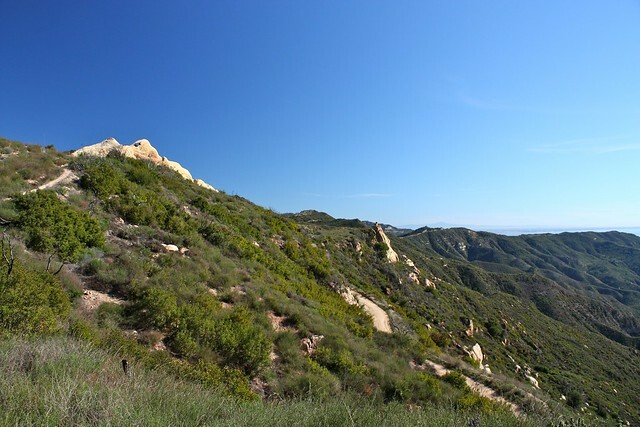 This area is drastically different than the areas along Malibu Creek, and offers great opportunities for rock climbing and scrambling, mountain biking, and just plain enjoying some ocean views on a clear day. 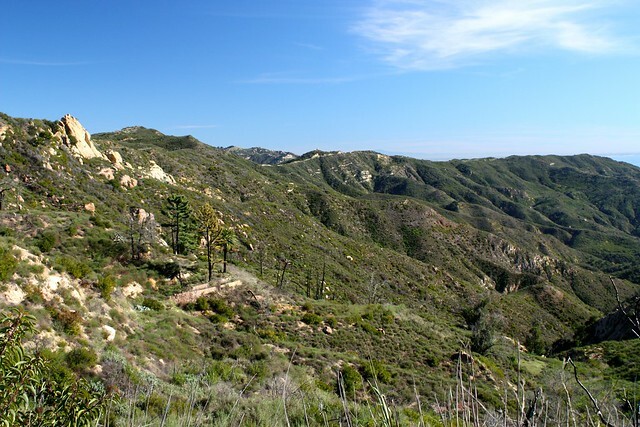 This particular route features a walk along the Castro Crest, then a descent along Bulldog Road for some elevation gain and loss – although it is possible to extend this route in either direction, or form a large loop hike. 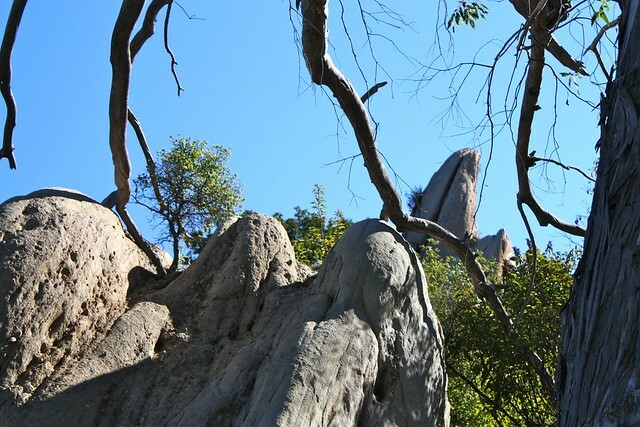 During one of our recent hot and sunny December weekends, my old Mount Whitney Team agreed to show me some of their favorite parts of Southwestern Malibu Creek State Park, a section of that park that I hadn’t yet explored. I was expecting your standard Santa Monica Mountains terrain – a few rocky outcroppings, low brush, maybe a shaded canyon or two – and this area certainly also features all of those things … but there are also stretches of trail here that will make you feel like you’re exploring a secluded rocky canyon in Utah. That is, until you look up and see the Pacific Ocean in front of you. 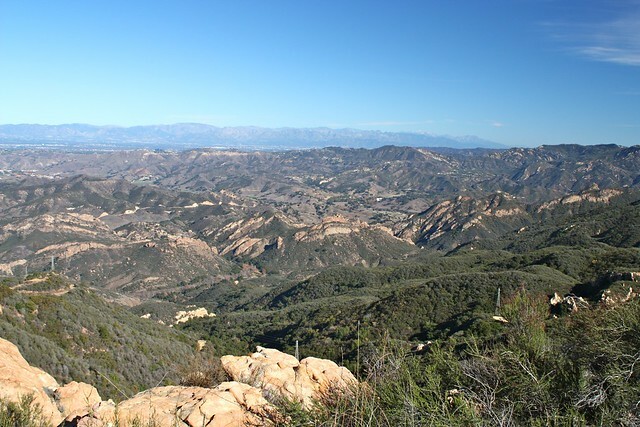 This route starts out at the end of Corral Canyon Road – the same road you’d take to hike Solstice Canyon. 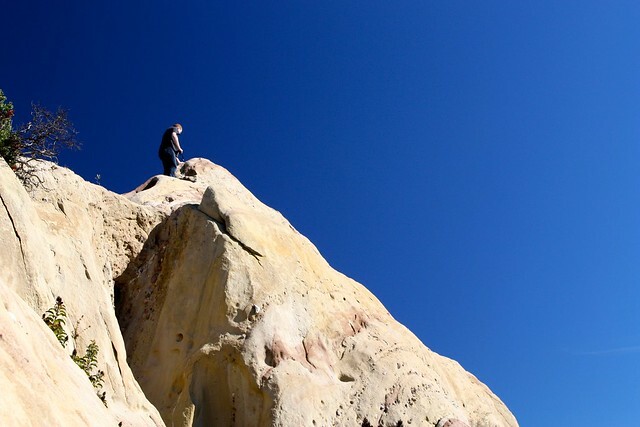 For this hike, drive past Solstice and through a few small “villages” of Malibu cliff-houses until the road dead-ends in a dirt parking lot. 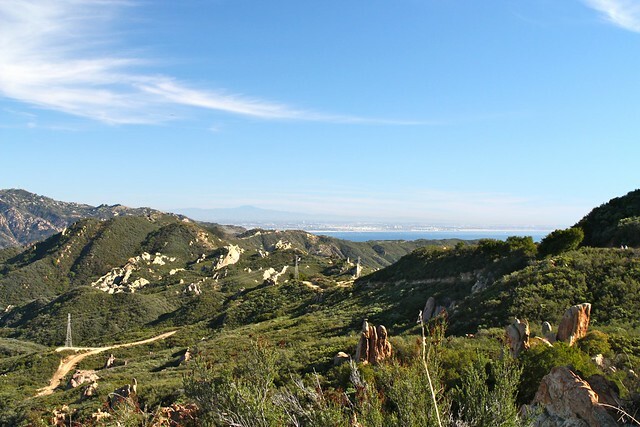 From here ,you can hop on the Backbone Trail in either direction, start climbing up the Castro Crest, or explore the Mesa Peak Fire Road Trail. From the lot, look toward the east for an unmarked fire-break heading toward some large rocky pinnacles. 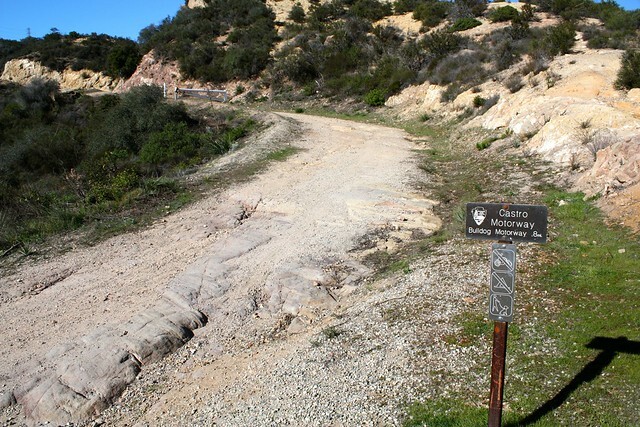 This is the Backbone Trail, and it’s the first path you’ll start hiking on. 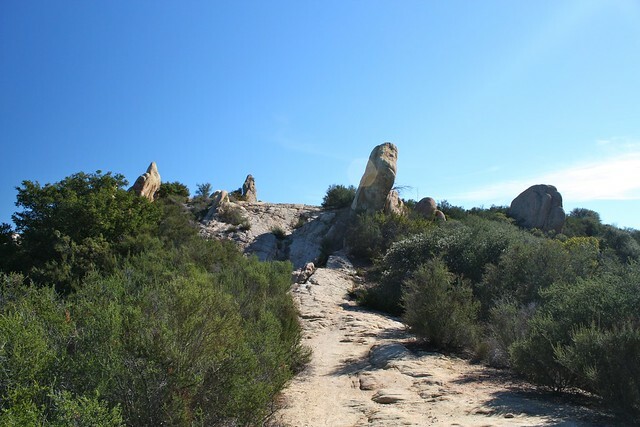 This path follows the ridge 0.5 miles east along some wonderful stretches of granite and sedimentary rock – similar to the formations around Sandstone Peak, but a bit more warped and weathered. 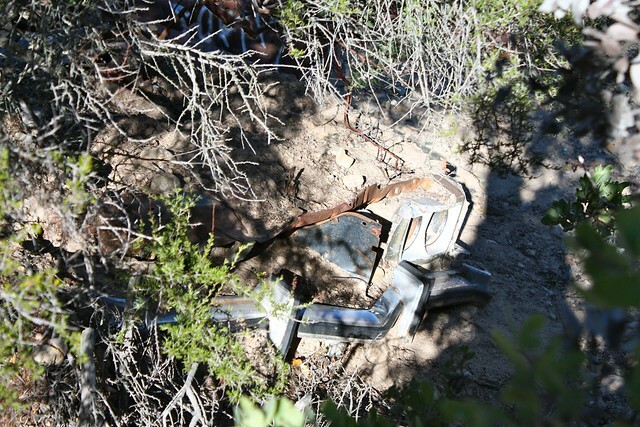 In fact, you’ll see quite a bit on this 4/10ths of a mile – including some fun simple scrambles, fantastic views of the Pacific, and an old wreck of a car that seems cemented into the dirt. Don’t feel bad about taking your time to explore. 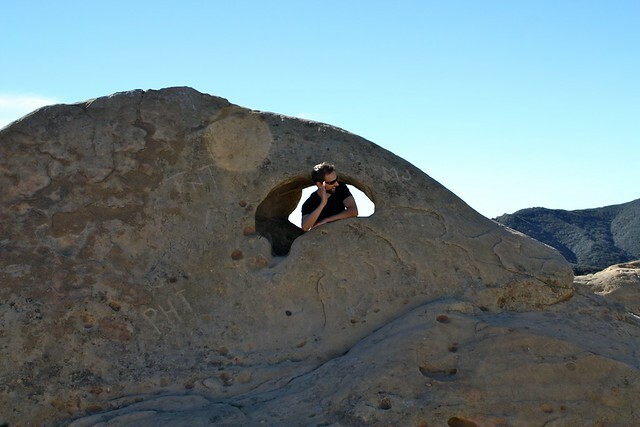 There is also a wonderfully wavy section of rock here that features a small but easily accessible stone arch. 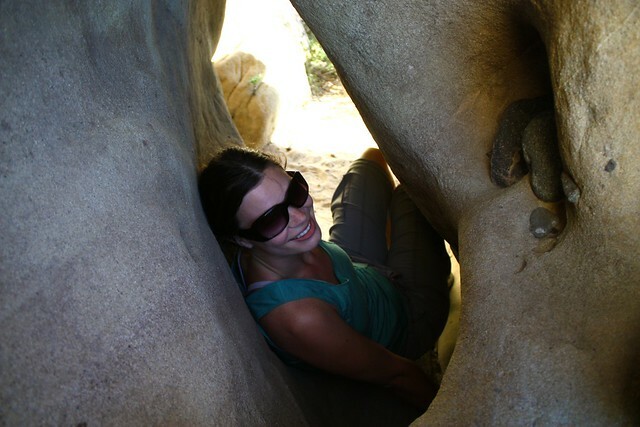 If you don’t mind getting your hands a little dirty (and you shouldn’t – you’re a hiker! ), a very quick scramble will get you inside the arch itself. From the junction with the fire road, you can continue east to Mesa Peak (1884 ft) in about 2.9 miles one-way. We chose not to – both due to time restraints and the fact that the peak is actually lower than the fire road you’re on … but even if you’re not headed to Mesa Peak I highly recommend continuing east about another 0.15 miles. 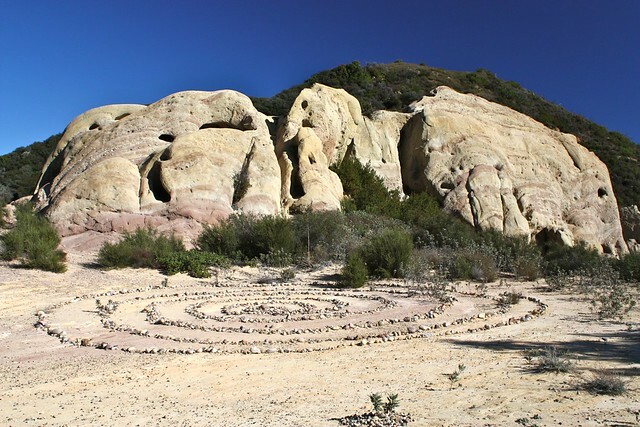 Here, on the north side of the trail, you’ll see another large rock formation and piece of hiker-art on the ground – a stone spiral. I don’t know how long this spiral’s been going, but apparently it has grown since the last time my hiking companions were there. If you’re feeling creative, feel free to add a few rocks to the outline to keep the spiral going. 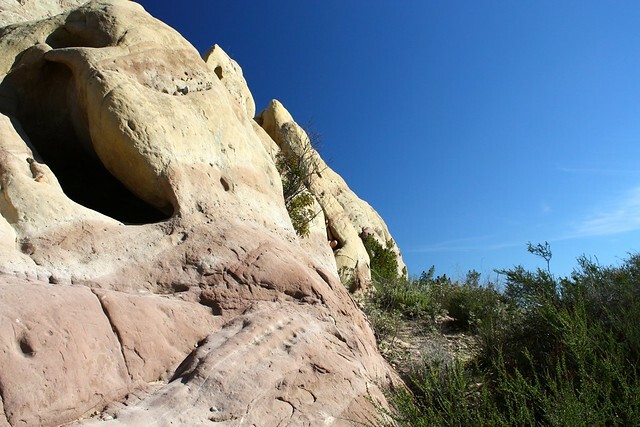 If you’re not, the rocky area behind the spiral has a lot of attractions, too – there are several small caves to explore and squeeze through, and some great, easy scrambling routes to the top as well. Be sure to budget some extra exploration-time for this area. When you’re done, either tackle the route to Mesa Peak or head back west along the Backbone Trail to the parking area where you began. 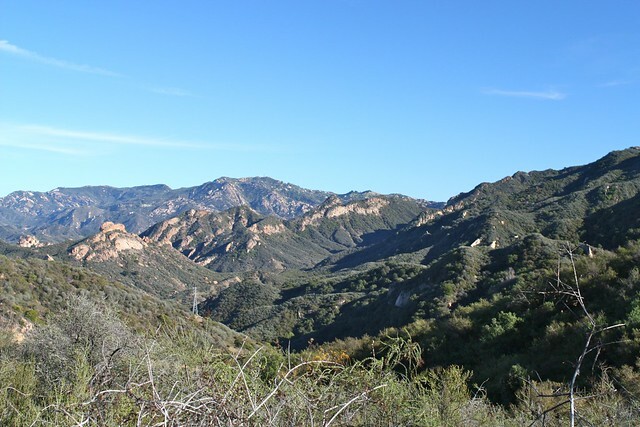 I took the Fire Road back to Corral Canyon Road, which is not necessary – but it does provide some interesting views south into the Malibu Bowl, including the foundations of an old burned down house in the canyon. Back at the trailhead, look for the sign for the Castro Motorway at the north end of the lot. From here, it’s 0.8 miles to the Bulldog Motorway, and the trail gains over 400 feet in that distance. It’s not necessarily steep, even by Santa Monica Mountains standards, but it’s the first big elevation push on this route, so be ready for it. There are a few use-trails and unmarked spurs on both this stretch of fire road and the Bulldog Road ahead of you – for this first stretch on the Castro Peak Motorway, just remember to keep heading up and west, and skip the two side routes. When this fire road hops to the north side of the Castro Crest, you’ll get some incredible views of Malibu Creek State Park below you. If you’ve been hiking along the creek itself, this view puts the park in an entirely new perspective – and will most likely give you a unique appreciation for the area’s geography. After 0.8 miles on the Castro Peak Motorway, you’ll come to a clear junction with the Bulldog Road. Castro Peak lies covered in radio towers ahead of you on its namesake fire road, but the summit itself is gated and unreachable on private land. Instead, take a right onto Bulldog Road here. Again, there are several construction roads, spur roads, and use trails along this section of the Bulldog Road. Make sure you consult the map to make sure you’re staying on the Bulldog Road and not taking a side-route into a dead end. This path down the Bulldog Road is mostly exposed, although it does have a few shaded areas as you get to the lower elevations. 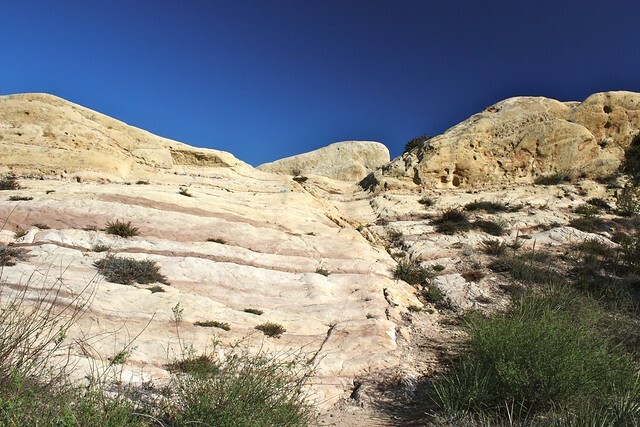 The path also crosses a noticeably cooler canyon with a seasonal creek bed. The turnaround point on this route was arbitrary, although you can continue another 1.4 miles down the Bulldog Road to the M*A*S*H site along Malibu Creek. When you’re done, return back to the trailhead the way you came in … and take your time. The uphill on Bulldog Road isn’t overwhelmingly steep, but it IS relentless. Good. There are a lot of fire roads, firebreaks, use-trails, construction paths, and single-track trails in this area. Most junctions are well-marked, but there are a few that aren't - and several paths that *look* like trails but aren't along the Bulldog Road. Be sure to take a map with you on this one. 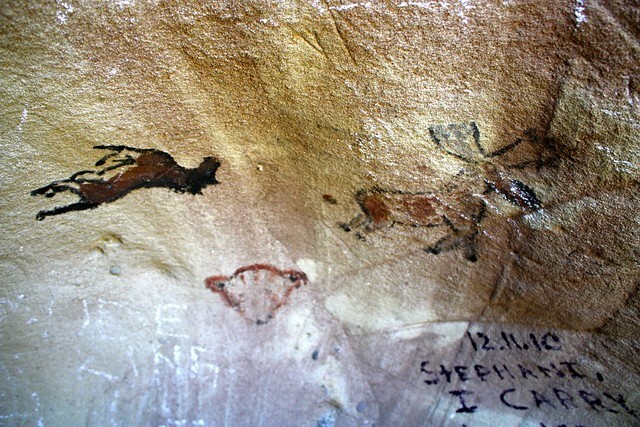 Camping is available at Malibu Creek State Park. I was there last week and saw the car. How in the world did it get there? A person could hardly walk to where it was. Very curious. I did this hike yesterday in about 3.5 hours and my truck along with other people's cars were fine when I got back. Hope this helps ? Thanks for the update, Jonathan. 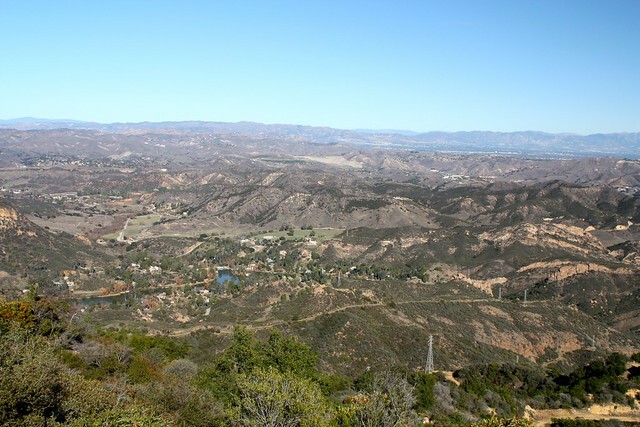 Be mindful about parking on Corral Canyon after hours. The Cal State Dep of Park and Rec has canvassed the area with "No Parking After 9pm" signs as part of their massive campaign to keep people out of the Morrison Cave. There is a guy driving a Miata with a hand-drawn logo (done by himself or grandkids it seems) that says something like "mountain fire patrol", who comes up late at night and effectively works as a snitch, calling the rangers on any parked cars. With these long summer days and warm nights it's nice to stay a bit after hours and stargaze, but park your car at another spot. Any recent successes on this trail? Looks great, but a little intimidated by the threat of car break-ins, especially since I'd be bringing a group of 3-4 cars. was there yesterday. there was a 'no dogs allowed' sign in parking lot. Does anyone know if dogs are allowed on this trail? Thanks! I hiked on a weekday, my favorite time to hike. I thought that if ever I were to hike the same place again, that the weekend might be safer because there would be more people using the parking lot. I would estimate that the thieves broke into the car next to me and attempted to break my window at around 2:00 to 2:30 pm. There were only two cars in the lot at the time (including mine), so that day and time may have been a bad choice. The sheriff's deputy that I talked to said he was going to speak to the park service people. If anyone would know about the rate of break-ins, it would the Lost Hills Sheriff's Office. Oh man, if Skip is right, then this is making me having to change my plans for next week. I was gonna go with some friends to hike the Castro Crest and Mesa Peak, but if there are thieves in the are, that is going to make me feel bad if something happens to my sister and her car, knowing I could have avoided it. Does any one know how often this happens?